An ultrasound is a painless, non-invasive, and safe diagnostic tool that allows us to visualize the internal organs of your pet. 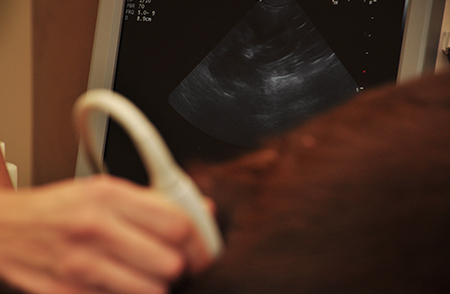 At Lone Oak Veterinary Clinic, our doctors use ultrasound equipment to diagnose a variety of conditions. An ultrasound allows doctors to get a better view of the internal organs of your pet, such as their liver, spleen, kidneys, and lymph nodes from many different angles. An ultrasound does not generally require any form of sedation. With the help of ultrasound doctors can quickly locate tumors, cysts, stones, inflammation and other problems within the internal system. Ultrasound can also be used to visualize the heartbeats of puppies and kittens during pregnancy to ensure proper development is happening. An ultrasound works by using high-frequency sound waves to produce a real-time image of your pet’s internal organs. These images allow our doctors to see how the organs inside of your pet are functioning at the time the ultrasound is performed.